Have you started a side hustle or thought about starting one, but can’t seem to find the time or energy to work on it? Now, that’s just dumb! I’m on the other side of the coin and would prefer to work fewer hours, make more money, and spend more time with my young kids and wonderful husband. But what about the side hustle? My husband and I used to both work at least 40 hours per week. Being that my former career was as a financial advisor, I spent many years (pre-kids) putting in 60-80 hours per week trying to grow my practice. Then we decided to start a family. Toss in some compensation and business expectation changes from my company and I needed to find a better solution. I transferred over to the franchise side of my company under a larger practice as a half support person and half advisor. I went down to a 40 hour workweek with a predictable salary and after having baby #1 decreased my hours yet again to 32 (four-eight hour days). Then, surprise! Baby #2 was on her way! We decided it made more financial (and family) sense for my husband to quit his jobs (even though he was the one with benefits) and become a SAHD instead. I stayed at the same 32 hour workweek and we cut back our expenses A LOT! Two kids under two in daycare is crazy expensive! Then this year I decided I needed more in my career life. I wanted to be more than a support person. I concentrated on investing time and energy into my financial planning business and then I got honest with myself and realized that’s not what I wanted to be when I grew up anymore. So I looked for something new. The universe provided me a direct path to a website called Leaving Work Behind, and the freelance writing side hustle was born! But now I encountered a new challenge. I wanted to do something different, but I was the breadwinner. We still wanted Wade to stay at home with the kids and I couldn’t up and quit my job to freelance full-time – or at least not right away! So I started my business on the side, with the goal of quitting my job a year later on May 1, 2015. I knew by hustling on the side, I could test the waters and see if it was viable. I could also (in theory) use the income that I made to pay down some more debt/pad our savings. I say “in theory,” as we’ve found plenty of ways to spend it (new business expenses, medical bills, most recently Xmas, etc). Some conversations happened at my office, which forced the issue and I moved my date up to becoming a full-time freelancer 1/1/2015. It’s been one wild ride! Luckily in November, 2014 I was able to clock in $4,000 of income, so I felt pretty confident about it. I was also able to sell my small practice, which will provide some income for the transition. But how does one find the time to build a side hustle in hopes of taking it full-time in addition to a day job, a family and all of the other responsibilities that come with running a household, etc? It’s like the answer to “how do you eat an elephant?” One small bite at a time! 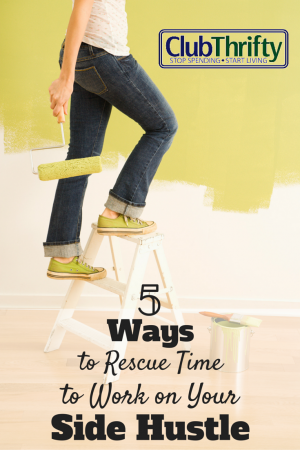 Here are my five best tips for rescuing time to work on your side hustle. This isn’t a brilliant piece of advice, but it is effective. My littles are early risers – like many times before six in the morning early risers! So I need to be effective and efficient with my time. That means that I get up at 4:45am (or at least I did when I worked). This gave me a solid hour and a half to two hours per day, which adds up to quite a bit over the period of a workweek! I’m naturally more of a morning person than a night owl, so this advice is better suited to those of you that are more creative in the morning. I don’t do well without much sleep and our youngest has been teething much of this past year. So, I go to bed early. Like not much after my kids go to bed early. It’s not super fun, but my side hustle is/was important, so during the week that’s what I did. And it worked, so it was well worth it! Obviously this is if you drink coffee! If you don’t, we can’t be friends;-). Just kidding of course, but this one thing helped to get me out of bed more mornings than I’d like to admit. I’d have loved to have slept in almost every day if I had the opportunity. But my alarm paired with hearing the coffeemaker doing it’s thing got me up and at ‘em in no time! It could work for you too! If you get a scheduled lunch break, use it to work on your side hustle. Be super organized and have a list/plan of what you want to accomplish in that 30 or 60 minutes. Pack your lunch and eat at your desk or in your car with your laptop. By bringing a brown bagged lunch and working during your lunch break, you can both save and make money at the same time, brilliant! This obviously only applies if you have young kids. For those of you with older kids or without any, consider the advice using your weekends instead! I hired a babysitter many a times this last year. Luckily we’ve got an adorable thirteen year old that charges much less than I can make in an hour’s time, so it’s a no-brainer! This way I wasn’t always saddling Wade with the kids and he got some “me time” too. Luckily I enjoy my side hustle so much (and am/was so focused) that I didn’t mind using my “me time” to work on my business. There were a few times that we would pair us both working with a date and have the babysitter cover the kids for both. Win, win! For those of you that may be wondering when I spend time with my kids, I engage with them before I leave for work and then after I get home for the rest of the evening. I also make sure to spend at least one full day with them on the weekend. All of this is so I can spend even more time with them as I take my side hustle full-time! Freelance writing might not be your bag and that’s okay. You might not need or want to quit your job and that’s okay too! You don’t have to! You can make money writing on the side (or via another side hustle). It can be enough to pay down some debt, take a vacation, fund your retirement or children’s education or it could support your family. In some ways, it’s up to you! Regardless of what your side hustle is, regularly finding the time to work on your business is important. Try getting up and going to bed early, setting your coffeemaker, working during your lunch break and on the weekends to get ahead. Every small focused amount of time spent on your business will add up to big results over the long run! How do you best rescue time to spend on your side hustle? Is Entrepreneurship Really Better than the 9-5? Great tips Gina, these are all helpful! I’m a coffee addict too and I’m sure that we can be good friends! Dark roast is my favorite, although Dunkin Donuts makes a mean hazelnut blend;-) Have a great day Kate! Great tips! Getting up early used to be my sure-fire way to get in some side hustle hours. However, now that I’m a stay at home mom with a six month old baby it’s harder because our daughter is a morning person too. :-). That’s honestly been one of my biggest struggles. But I can still usually squeeze in an hour or two of work when she takes her morning nap! I fee like I could have written that first paragraph myself. Kids certainly make you shift your priorities. I do like my day job most of the time, but I’ve found a way to do it less so I can be available more for family and life. I am very curious about your RV trip around the US. That is on my bucket list and I’ll be anxious to see how it goes for you. Nice post! I have a similar goal to leave my full time job and focus on my side hustles. Gald to know it’s worked well for you. Finding time has been a challenge. I do spend some time on it while at work. Mostly a few minutes at lunch and during breaks. But that adds up to maybe 3-4hrs a week! 3-4 hours per week over the course of a month or a year can do a lot of damage (in a good way!). Good for you for taking what time you do have and being productive with it. Many people in your position would say that they “don’t have enough time.” You’re not using the excuse and I love it! I used to not drink coffee…but now that I have a child…yes I drink coffee. I guess that means we can be friends =) Now that I have a child, I wonder what I did with all my free time when I didn’t have one! If only I decided to side hustle when I had more time…but even still, I need to work on making time for it. Glad we can drink coffee and be friends:-) We’ll both need it with everything on our plates! Good tips Gina! I’m working on growing my side hustles so I can quit my FT job too. Hi Kayla! We’re in this together. I recently took the plunge, but each day is a battle:-) Cheering you on! You won’t see me up early! Though my son gets up at 7, I’m not an early riser. I’m a true night owl and will do my best work after 8pm! Either way works! I “want” to become a night owl;-) My husband is and we could spend more time together that way! I’m horrible at #2, which makes it a lot harder to do #1 consistently haha. I’m definitely glued to my computer during my lunch break though! I actually eat while I’m working right before so I can dedicate the whole hour to writing. Very relevant to me right now. I’m struggling with finding a balance between a side hustle with guaranteed hourly income and building another that doesn’t have the immediate payoff, all after the kids go to bed…so not much time! Glad to hear it’s relevant Mark! That’s a tough decision, but maybe go after the one with the longer-term pay-off that’s larger? For writing in particular, I once read some great advice that was to take on lower paying writing jobs, rather than a part-time job (providing they were comparable income) in order to practice your craft and get better – to at least be in the same industry that you’re trying to progress into if that makes sense? Either way, good luck to you!! Getting up early has been absolutely key for my husband and me too! We’re able to squeeze in about 2 hours of productive work before we have to go to our 9-5’s. It seems like such a simple thing, but it was tough for me at first to transition my schedule. Now that we do it though, I can’t imagine going back! Good for you guys. It’s nice that you’re both doing it and can egg each other on! It’s also motivating that you’re both motivated; love it! I started my side hustle of freelance writing last year and the one thing I love most about it, is the fact that it keeps me motivated. I actually quite enjoy my day job still but it is totally routine. Having a side hustle is a great way to keep my creative side going. Barry, that’s a great point. I’m glad that you like your day job and have found fun (and income generating) ways to express yourself creatively! Thanks for reading and for your comment! Just stating the obvious — you found time for your family and side hustle by cutting your employment hours in half, from 60-80 hours per week down to 32 hours per week. Good job making it work for you! It sounds like you’ve found a nice balance now. Really enjoyed reading your post, Gina. I’m also interested in starting to do some freelance writing but I don’t know much about it as a side hustle. What kind of freelance writing do you do? Would it be finance related since this is your background or something else? I’ll be sure to check out the reference you mention above that got you going in the “write” direction. 😉 How would you recommend I go about learning about beginning to freelance write? I’m a health care professional with a master’s degree & have published a number of peer-reviewed articles in my career but I suspect freelance writing would be very different from academic writing. Thank you in advance for your time & all the best in your exciting new work. I’ll be sure to check out your site too. Hi Leona! You’ve got a great background for freelance writing:-) There are clients looking for work like you’ve already done, as well as clients looking for more blog style articles.